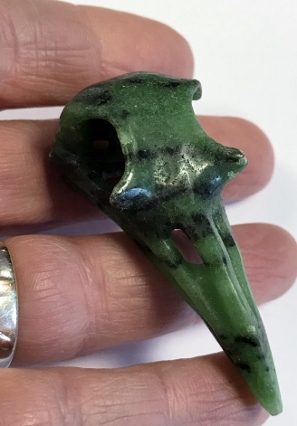 This Zoisite crystal skull has been carved in the shape of that of a Raven. There are many associations with Ravens, strongly linking them as spiritual guides, particularly in times of transformation. They are a symbol for creativity, humour, truth and curiosity. More often seen with inclusions of Rubies, Zoisite works with the heart chakra, aiding expression when there's a need to throw off the weight of repressed feelings, dispel negative energies and connect with the spiritual realms. Zoisite is also a stone focus, bringing us back on track with a creative flare, and aiding recovery from illness or stress. Rubies form within Zoisite in several localities, notably India and Africa. Both crystals carry an energy for a growth spurt in all areas of life. The ruby brings passion and courage and Zoisite adds self-awakening and perception of the heart's desire.